One of the biggest complaints I have ever heard about college students is that they bring piles of laundry with them when they come home to visit. This part is true, and it is piles. The lie for me is that I don't feel resentful about it...I LOVE IT. Let's face it, I don't get to do much for my baby anymore, so each load of laundry is done with love. I use the "good soap" and put fabric softer in the washing dispenser (which I don't always do), then I use dryer sheets in the dryer. Part of the reason for this is to get rid of the old moldy dorm room smell, it smells just like you remember. 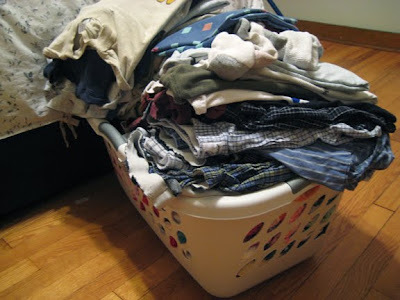 I fold each piece meticulously and place it lovingly into the basket (that is a picture pulled off the internet, my basket was embarrassingly more OCD). I swear I am just short of placing sappy little notes in the piles that say, "Miss you...Love you...Thinking of you." It is pathetic! Check this out http://dormmom.com/. I think it is a cool idea, but who has the money to pay for this after paying tuition? Good Grief...I can afford no more! I REALLY needed to read this! I'm still caught with 3 simi-little ones and the day to day makes me crazy. I need to take a moment to realize I will miss these days.